The intrinsic factor test checks for intrinsic factor blocking blood antibodies. What is an intrinsic factor test? The intrinsic factor blood test checks for intrinsic factor blocking antibodies in the blood. Why is an intrinsic factor antibody test important? The intrinsic factor antibody blood test helps check for an intrinsic factor deficiency. Is any special preparation required for the intrinsic factor (IF) test? It is recommended that one avoids B12 supplementation or injections for 1 week prior to getting this IF blood test. This Intrinsic Factor Test is a blood test. The intrinsic factor test, also known as an intrinsic factor blood test, intrinsic factor antibody blood test and gastrin intrinsic factor (GIF) test, measures the intrinsic factor antibody blood levels. Intrinsic factor (IF) is a type of protein produced by cells in the stomach known as parietal cells. Intrinsic factor is heavily involved in the binding and subsequent absorption of vitamin B12 by the gastrointestinal tract. In some people, the immune system becomes overactive and produces intrinsic factor antibodies - a special type of protein - that binds to intrinsic factor. When bound, intrinsic factor can no longer bind vitamin B12. As a result, an intrinsic factor deficiency state (low levels of active intrinsic factor) occurs, often leading to a vitamin B12 deficiency. In severe states, intrinsic factor antibodies (IF-blocking antibodies) coexist with parietal cell antibodies and can lead to a condition called pernicious anemia. Often, this intrinsic factor blood test is ordered at the same time as the parietal cell antibody test. Also, because of its important role in B12 absorption, the IF blood test is also frequently ordered along with the B12 blood test. To get an intrinsic factor blocking antibody test near you, order online and get your blood drawn at a Quest Diagnostics lab. Once the IF blood test lab report is ready, it can be downloaded. As shown on the sample intrinsic factor blocking antibody blood test lab results above, the lab will report negative if no intrinsic factor antibody is detected. For best results, the intrinsic factor blocking antibody test should not be performed until seven days after a vitamin B12 injection. 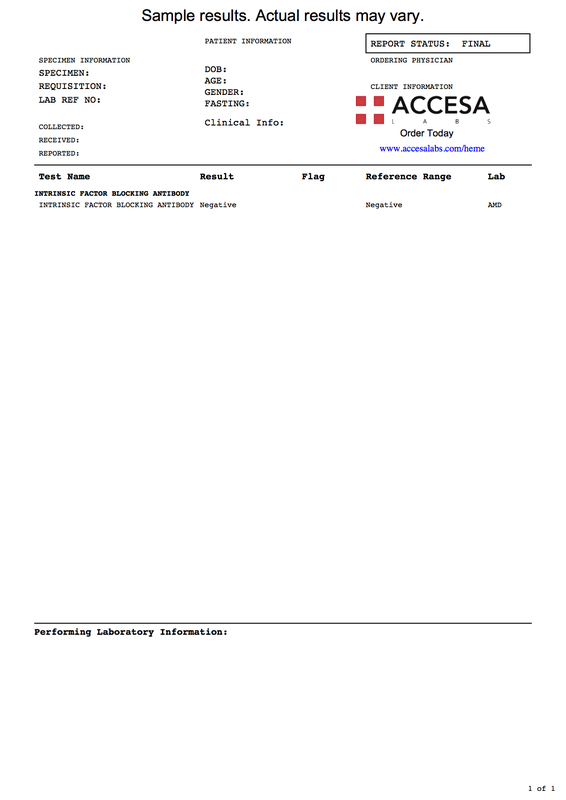 As can be seen on the IF-blocking antibody sample report provided above, a negative result will be reported if no intrinsic factor antibodies are detected. This intrinsic factor deficiency test is a component of the anemia test panel. Intrinsic Factor Test at Guaranteed Prices.